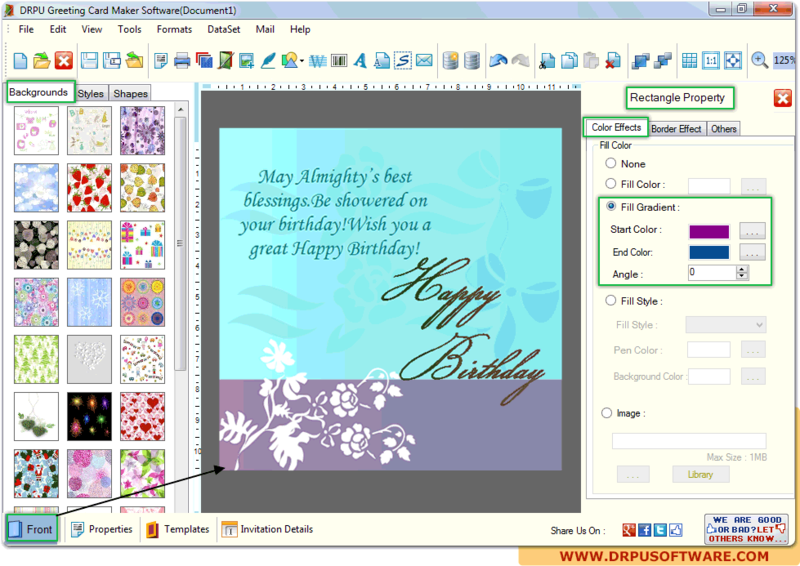 DRPU Greeting card maker program creates customized and colorful greeting card for birthday, wedding, congratulations and many other occasions. Now you can easily design and generate greeting cards using various designing objects including Text, Signature, WordArt, Clip Art, Barcode and image. With greeting card designing program, you can create greeting cards with different shapes as well as sizes as per your need. Create Greeting cards in Rounded Rectangle, Rectangle, Ellipse and CD/DVD shapes as per your need. Provide facility to specify the color and background settings of Greeting Card including Solid color, Gradient, Image and Style settings. Empower you to design Greeting Card with Quarter Fold (Side Flip), Quarter Fold (Top Flip), Half Fold (Side Flip), Half Fold (Top Flip) and Postcard (No Fold) option. Enable you to set Card Name and Card size according to your need. Provide facility to add Backgrounds, Styles, Shapes and Greeting Templates on the card. Allow you to select image from library during Greeting Card designing process. Provides Data set series feature to generate multiple copies of Greeting cards with different barcodes and text value. Allow you to save created Greeting card in (.GTM) file format. Provide facility to print designed cards using advance print settings.